We pride ourselves on making our training partners better every time they step on the mat. We know that the better they become, the better we will become and the better the academy becomes. 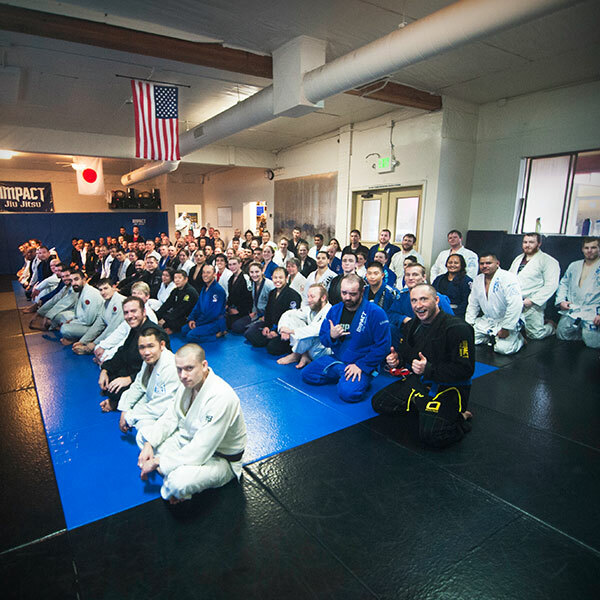 At the Beaverton Impact Jiu Jitsu Academy, all visitors and new members are highly encouraged to participate in our free 30-minute orientation class. In this class you will tour the gym, learn some basic Jiu Jitsu terminology and moves, and have the opportunity to ask lots of questions. If the orientation class is not available at the Impact location you are visiting, or if you’ve done a bit of Jiu Jitsu before, you are welcome to start with another beginner level class. 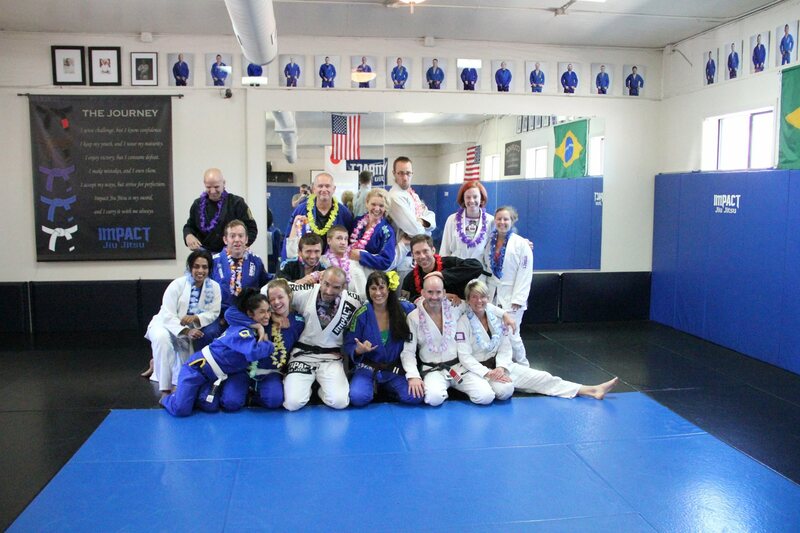 Our instructors and students are prepared to help you learn the ropes in any of our beginner BJJ classes. Brazilian Jiu Jitsu is a martial art, combat sport, and a self-defense system that focuses on grappling and especially ground fighting. Brazilian Jiu Jitsu is widely regarded as the world’s most effective grappling art. Brazilian Jiu Jitsu promotes the principle that a smaller, weaker person can successfully defend themself against a bigger, stronger assailant by using leverage and proper technique—most notably by applying joint-locks and chokeholds to defeat the other person. Brazilian Jiu Jitsu can be trained for sport grappling tournaments (gi and no-gi) and mixed martial arts (MMA) competition or self-defense. Sparring (commonly referred to as “rolling”) and live drilling play a major role in training, and a premium is placed on performance. In this class, we cover the basic movements, positions, and concepts of Brazilian Jiu Jitsu. We emphasize good technique, mobility, pressure, and leverage awareness over sheer strength. This class is for athletes who are interested in establishing their foundation in BJJ. Our Brazilian Jiu Jitsu classes teach Gi techniques and No-gi techniques. This class is perfect for beginners as well as more advanced students looking to sharpen their fundamental skills. In this class our curriculum expands to cover the blue belt requirements. Students are taught the collection of techniques we deem necessary to be awarded the blue belt. The BJJ 1 & 2 class focuses on drills, techniques, and live rolls. As students approach the end of this class series, BJJ awareness and gameness will be apparent. In the advanced class, students are exposed to even more technically complicated strategies and setups. Students are shown how to push their own limits through live action and coaching and are given the opportunity to develop their own BJJ voice and style. Through training with peers, advanced students and coaches, students will experience growth through creative solves to BJJ situations and applications. 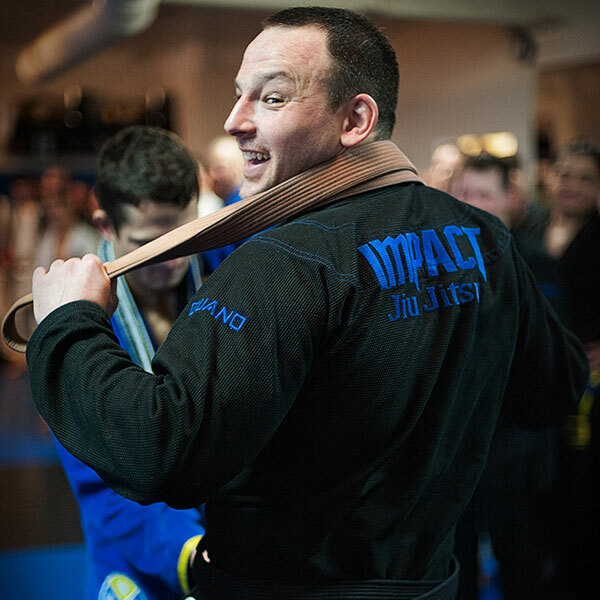 Impact members benefit from specific training in Judo by our black belt instructor. This class covers the fundamentals of balance control, body positioning, grip fighting, and entry in to mat-work through throwing and take-down techniques to enhance any MMA or BJJ athletes’ skill set. Mixed Martial Arts (MMA) is a combat sport that allows a wide variety of fighting techniques, from a mixture of traditional martial arts and modern combat styles, to be used in competitions. The rules allow the use of striking and grappling techniques, both while standing and on the ground. Such competitions allow martial artists of different backgrounds to compete. * The description was adapted from Wikipedia. Our Mixed Martial Arts (MMA) training sessions cover concepts from boxing, kickboxing, Greco-Roman wrestling, Judo and Brazilian Jiu Jitsu. Emphasis is placed on good boxing structure, footwork, body mechanics and timing. Class components include mobility, range awareness, boxing hands, Thai legs, elbows, knees, basic clinch and ground techniques, as well as self-defense strategies for use in common street situations. This is a fundamentals class designed to help new members focus on the primary tools of each range and learn key vocabulary. The program introduces the core concepts that run through all of our classes. Members who master these concepts may choose to move on to our MMA Advanced class. Advanced MMA is an invite-only class. Participants must demonstrate an ability to participate in fight training at the most demanding levels. All fight ranges are trained. Participants must be willing to commit to team training and help prepare those athletes who are scheduled to fight. A premium is placed on participants’ fitness condition and willingness to improve all aspects of his or her fight game. Specific training and safety equipment is required. 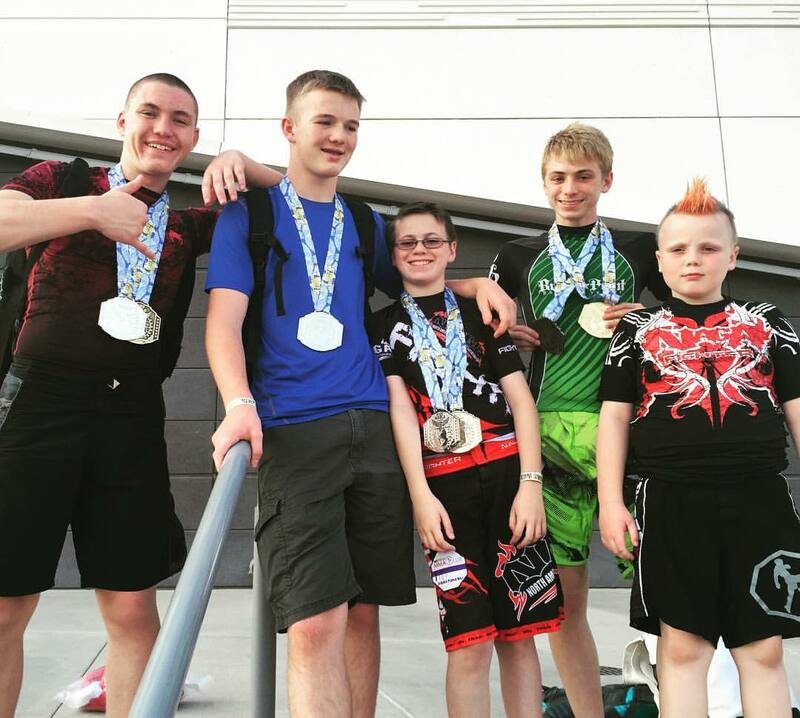 In order to excel in MMA, athletes must become proficient in many different disciplines. Impact members benefit from specialized kickboxing instruction. These classes greatly enhance the skills of our MMA fight team and hobbyist members. Technical instruction, drills, and sparring are a part of every class. Our MMA athletes are especially well rounded. Our boxing instruction teaches both beginners and our advanced fight team technically sound striking, combinations and movement. 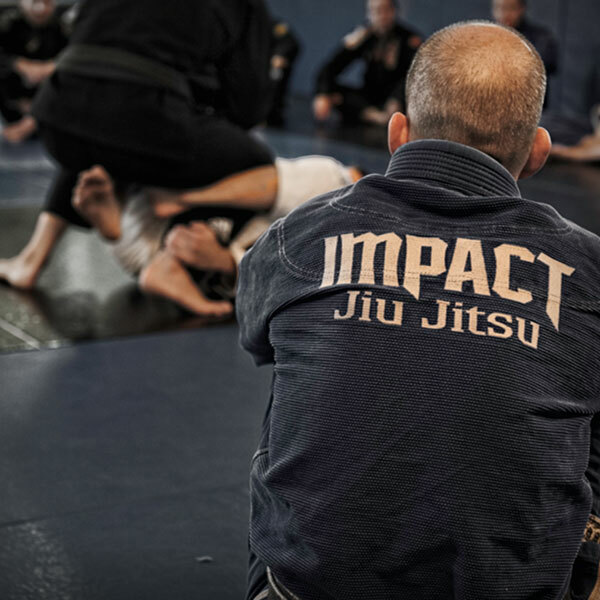 For the past 20 years, Impact Jiu Jitsu has been building the self-confidence, focus, physical fitness and self-defense skills of our students. 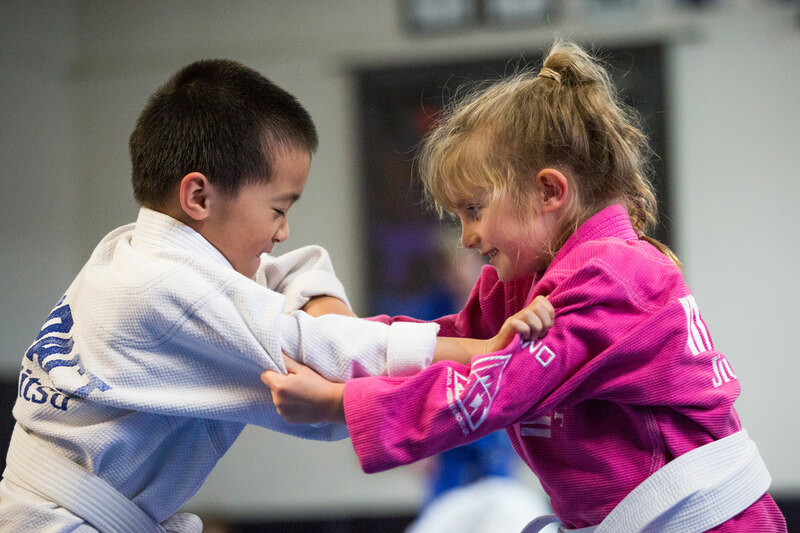 Our Youth Program provides the highest level of technical Jiu Jitsu training, a focus on values and character, and a meaningful system of promotion and accomplishment – all in a safe and fun environment. While Brazilian Jiu Jitsu is our main focus, we also periodically incorporate self-defense and anti-abduction training. This includes some striking (punches and kicks). The youth classes are fun and energetic and give the kids a real sense of accomplishment and pride in what they learn each day. Tuesday & Thursday: 5:30 to 6 p.m. In this game-based class, students learn team values (respect), to recognize and demonstrate basic positions and movements, Jiu Jitsu language, and grappling-specific body movements. Monday & Wednesday: 5:30 to 6:30 p.m. | Friday: 5:30 to 6 p.m. 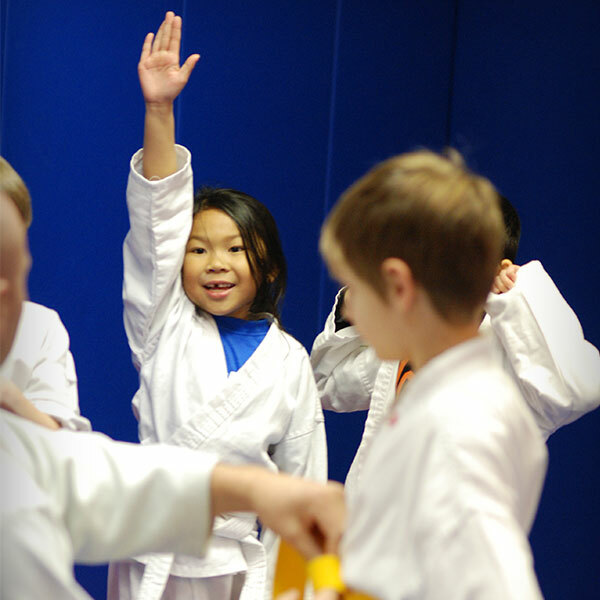 In this class, students focus on team values and continue their understanding of positions and movements. They begin to add more transitions and link moves together. Age appropriate submissions are introduced. Monday – Friday: 4:30 to 5:30 p.m. This age group is ready to put it all together. Students learn age and skill appropriate Jiu Jitsu that translates directly to the adult curriculum. More time is spent on technique, drilling, live rolling, and tournament preparation. Impact’s teen students are focused on the white-to-blue belt curriculum and are challenged to link their growing knowledge in live drilling. With maturity and skill, the instructors direct the gradual transition to Impact’s adult classes. Monday through Friday: 4:30 to 5:15 p.m. In this class, Impact’s younger students receive technical Jiu Jitsu training, covering fundamentals from take downs, positions, and transitions, to age appropriate submissions and competition skills. The importance of teamwork, focus and values is a regular topic. Monday through Friday: 5:15 to 6:15 p.m.
Monday, Wednesday, Friday: 5:15 to 6:16 p.m.
Impact Jiu Jitsu offers group and individual strength and fitness classes to enhance our members’ overall martial arts experience. Our group fitness classes, Fight Fit, are run in a circuit training format and are designed to improve participants overall fitness, strength and explosiveness. Impact’s trainers also offer customized programs and training to meet client’s individual needs, whether they are recovering from an injury, preparing for a competition, or getting back into shape. This is a group class designed to improve students’ overall fitness by challenging participants in a dynamic, energetic fashion. Students go through a warm up followed by a dynamic circuit designed to build strength and endurance. Kinstretch is a movement enhancement system that develops maximum body control, flexibility, and usable ranges of motion. 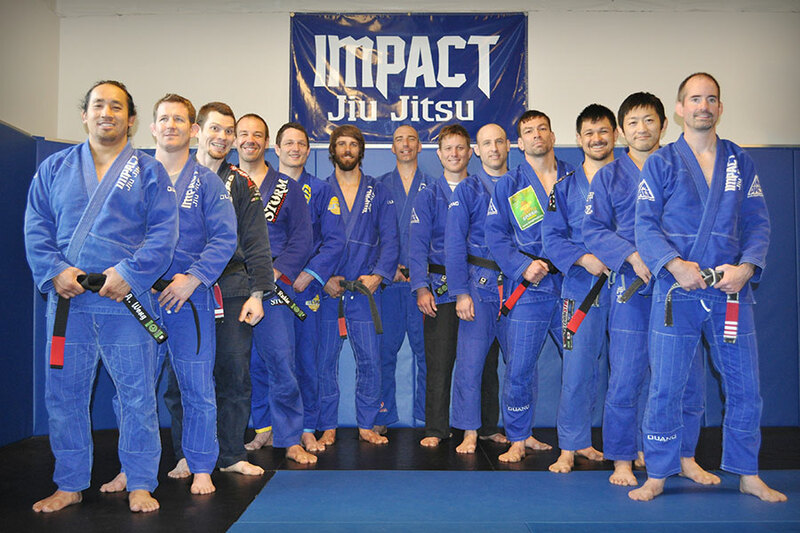 Level 1 Kinstretch Instructor Cory Carllson leads this group class at Impact Jiu Jitsu Beaverton. Semi-Private Training is perfect for people who would like more individualized training but enjoy the social and competitive nature of group training. Participants enjoy a group discount (compared to personal training) while still receiving personalized coaching and program design. Group sizes vary. Personal Training is a great option for someone who prefers a one-on-one coaching relationship as their primary form of training or for people with variable schedules—including athletes, executives and stay-at-home moms and dads. 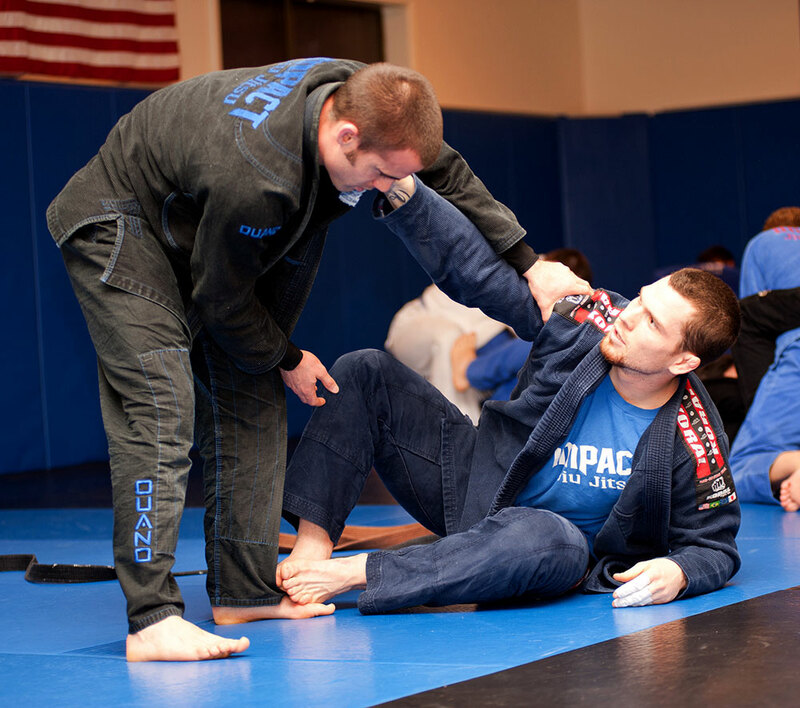 Impact Jiu Jitsu’s self defense programs teach participants how to recognize possible threats, avoid vulnerable situations, develop safe habits, and present themselves as strong adversaries. Students learn skills to distance themselves from an attacker and how to effectively fight back. 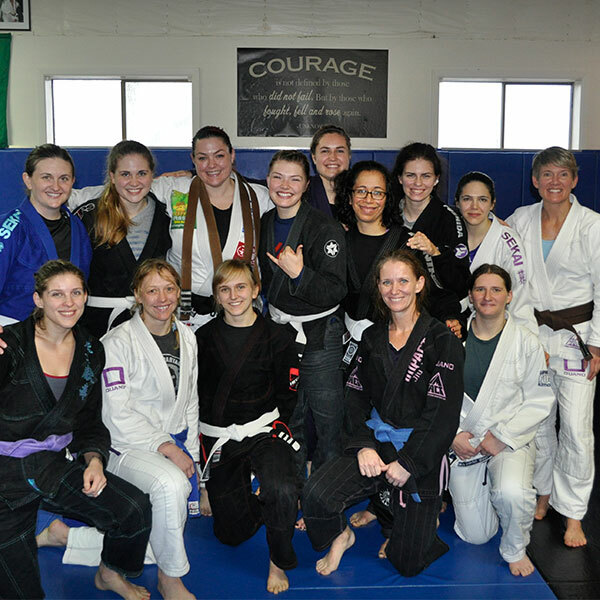 Impact Jiu Jitsu offers self defense training to both individuals and groups. For more information on upcoming dates and personalized options, please contact Tracy Chapman.